We are the remarkable entity, engaged in offering superior quality Air Oil Separators. We are successfully meeting the requirements of our clients by distributor the best quality range of Mann Air Oil Separators. Air Oil Separators remove compressor lubricant from the compressed air stream. An Air Oil Separator reduces the lubrication oil entrained in the compressed air to 2-3 ppm. 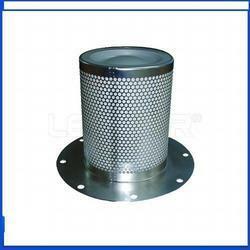 Air Oil Separator is used in various industrial applications. They provide different features like heat resistant, high stability, durability and optimum performance. Hence, these are available in different sizes and specification as per the requirements of the clients as that are applicable to separate oil from compressed air. 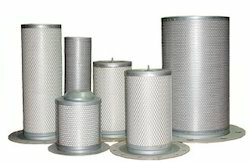 Deep filter air/oil separators have several grades of glass fiber filter media wrapped on them. The benefit of a deep filter separator is increased air flow capacity similar to a pleated separator, while maintaining a low initial pressure drop and residual oil content. These separators can handle more oil aerosol than a conventional or pleated separator. We are manufacturing and supplying a wide gamut of Air Oil Separators for screw compressors. The offered oil separators are used to separate and reclaim lubricating oil from the air-stream of air compressors in general rotary screw compressors. We manufacture oil separators for refrigeration screw compressor packages to separate oil from the refrigerant gas. They are provided with aeration units and relevant accessory filters & magnetic separators. Tte Engineers Bombay Pvt. Ltd.
Development and customized design of air/oil filtration systems improves compressor performance. A new laboratory helps us to continually improve our technology. - Over 300 models of air-oil separator elements are available utilizing a cylindrical or pleated design of micro glass with a variety of flanges, gaskets and kits. Process plant equipment such as Dryers / Filters/ Separators are designed in material of construction like carbon steel, SS304, SS316, etc. These are tailor-made to suit individual requirement.